Allow me to introduce Mr. Rajat Mitra. 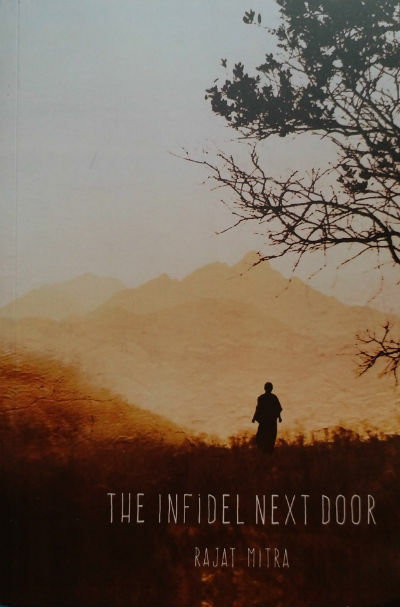 Though “The Infidel Next Door” is the first book by him, he is well known to many people. His work in the area of human psychology allows him to meet many people, especially, those who are affected somehow through the terrorism. 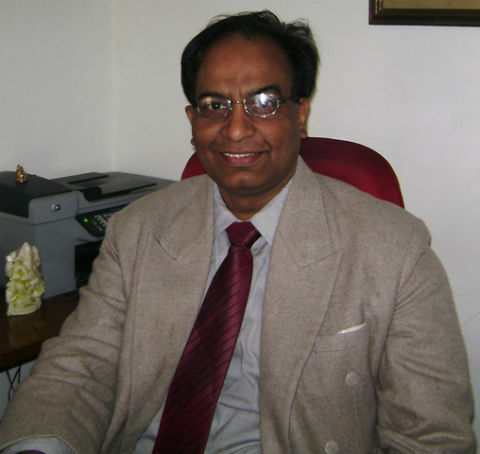 His long experience in the field made him understand the human psyche in the better manner. The unrest in Kashmir – the heaven on the Earth – seems touched him deeply. The brutal genocide of Kashmiri Pandits, the misguided locals who often feel manhandled is something that could have caught his nerve. And, he came up with this book. Impressed by his writing style and the way he has penned down a comparatively long enough historical fiction which tries to explore the realities and the psyche of the people experienced it via fictional characters in a story; we’ve decided to have an interview session with him. Fortunately, the things worked out as expected and from our team, I got a chance to have this interaction with him. We thank you on behalf of the team ThinkerViews to be available for an interview. Congratulations on getting your book The Infidel Next Door published. It is a kind of a cliché question, obviously, you are feeling joyous, accomplished and happy, but, each success comes as a stepping stone, right? Do you feel inching closer towards your goal? When I initially conceptualized the book, I didn’t think writing this book would ever raise a hornet’s nest. People after people turned away from me saying this book will not be good for our society to read. This is about trauma of the destruction of temples and how it has affected the Hindus. Why do you want to raise such a topic? Our society is not mature. There were many reasons I was given to abandon writing but I still wrote and finished it. I wrote it as a plot where a Hindu priest and a Muslim imam come to live next door to each other in Kashmir and the issues they resolve to discover their identity and find peace. Today, as more and more readers find in it something of their own lives and tell me about it, I find this may be touching a raw nerve in many people. Some readers have said that it told them of the fundamental conflict between the Abrahamic religions and Hinduism. Some readers say they found it a love story. Some wrote back to say that it tells them about the true history of Kashmir and how Islam came to dominate the land by exterminating Hindus as a race and which has a terrifying parallel to what is happening in Europe today. A nun who read it said she found peace in reading the book and gave it to other nuns to read. The book is generating a debate and I see it is making people question many assumptions they held. Most books on such topics follow a certain line of thought where they shy away from mentioning the trauma faced by Hindus over issues such as temple destruction and forced conversion. Yet these issues are pivotal to awakening of our society from a colonial mind set and to understand the central position that nationalism occupies in our country. Behind this nationalism there is a submerged grief that laid dormant for centuries. My book covers an issue that is topical, sensitive and needs a debate and that is on creating peace and reconciliation in the name of religion. The story of Aditya and Anwar is symbolic of how two opposite streams of thought and one that borders on exterminating the other can give up its hatred of the other. I feel I have taken a small step ahead towards my goal. I wish to see my book in the hands of every young man and woman of India belonging to all religions, castes, groups who can discover the idea of India that has grown, nurtured every form of diversity not seen anywhere else. I want them to know the tragic history of Hindus who stayed secular without giving up their faith in the goodness of man despite the brutalities inflicted upon them. work with human rights defenders who are in trouble because of their views. I also work on prevention of human trafficking and slavery. All this while deviating from the mainstream psychology, taught me about human condition in a way that I would have never learnt otherwise. I worked with diverse groups in different countries, terrorists in Thailand and India, women victims of atrocities of security forces, refugee children who are victims of war crimes. All these gave me a in-depth view of what it means to be humane, balanced and not limited to only one perspective that has dominated all discourses. This is what I try to bring in through the different characters of my book. My passion is to read. My favorite books are with themes of history, psychology and philosophy that often are quoted together when I study the past. It pains me when I see the distortions that the Marxist historians of our country have done to the entire period till present including the history of the freedom struggle of our country. Even when one may not be a trained historian we need to understand it affects the identity of our people. A4. It is I guess a churning process. When you observe with the eyes of a part psychologist, part poet, you realize you have turned inwards and your observations have filtered, merged into a language you didn’t know existed before. The language presents a nebulous reality, a truth you hadn’t known but their words seem to form a meaning of their own. My writing process is perhaps like that. In my book The Infidel Next Door I imagined what would be life for two people who see God differently and where one of them has a history that his ancestors destroyed temples because it didn’t match with their idea of God. Writing is a process that came to me rather late in life. I wrote psychological reports but they didn’t reflect the human condition, the injustice meted out to people, their dreams, their hopes. It was a dry sheet of paper that reflected nothing more than a few attributes, a few beliefs. It didn’t say why they have those beliefs, their society and community punishing them for having so and the injustices they have borne. My writing is therefore can be said to have its origin in a rights based approach, a psychology describing the human condition. What inspired you to write – The Infidel Next Door? As writing such books require a courage to talk about something important which people tend to ignore, did the thoughts of possible controversies and consequences touched your mind when writing it? A5. There was no inspirational moment as such. There were many ideas that occupied my mind and crossed it from time to time. Yes the thoughts of possible controversies was always there and I quite often thought about it. I was worried about safety too. My friends and family told me that you may have difficulty in finding a publisher which later turned out to be true and may have religious groups that may not like the book. But as I wrote on, I realized I am not creating any controversy. I am only writing about ones that already exist and my writing may help in healing and creating a viewpoint that brings a closure. Sadly, I also realized that in India the writing space is dominated by one particular ideology who try to suppress alternate points of view but that is true of every period of history. Any mature society has to first come to terms with its past through writing, poetry and all forms of literature if it has to carve out its own identity and move on with the new one. When I wrote, I had decided I will not think of the controversies and consequences because then it will affect my writing. After I wrote certain section I rewrote making only minor changes that do not affect the flow, the pace and the content. I retained almost everything of the original that I had in my mind when I conceived the book. For example there is a portion when the antagonist Anwar goes inside a temple and is shocked because it challenges his notion of a formless God. I wrote it and retained it as exactly as I had written it the first time. What are the major challenges you faced when writing the book? Major challenges I faced were several. The very theme of an interaction between a Hindu priest and a Muslim imam and how they see each other, their religion, their practices was a major issue that had to be done very sensitively. I asked many from both sides their first reaction of seeing and coming face to face with each other and how they remember it. I had to see I represent their thoughts and feelings truly yet do not offend anyone or become biased. I asked them again after I had written the chapters if they felt I had written it truly. I met many people belonging to all religions, not just Islam and Hinduism but Christianity, Sikhism and even Jewish to ask their feedback. Many of them found it deeply healing and felt closer to God after reading this and not a critique of any particular religion was my biggest takeaway from this exercise. Another challenge was how to make the stories of the people fit in a framework that is not ahistorical. I had to present a lived reality that could be described in a language that people could understand and feel as if I am talking about them, their past. Time wasn’t a challenge for me. I wrote everywhere, in my off time, on sea beaches, in lunches and intervals, in planes while travelling, while waiting at airports. I even wrote in an ashram, in a monastery and in a hotel where I couldn’t come out as there could be a threat of a terrorist bombing. One thing I realized is that truth is scary for many people and writing the truth is scarier. My family and friends asked again and again why I am not writing about safe topics, about college romances and issues that are banal. None of them contradicted or changed my writing but said that why rake up the past? Why are we Indians so scared about introspecting the past or going into it? How will we become stronger if we don’t confront it? Till then can we call ourselves a mature society? I wonder. All through the process, I kept it hidden and never shared it with anyone outside my immediate family, I needed support which I got from within. Many people say parts of the book are disturbing as it reflects a profound human condition, a reality that hasn’t changed since man invented religion and our relation to that ideology where a cosmic reality higher than us is looking after us. I can’t say I enjoyed writing any part as much as I felt transformative after writing that. For example the challenges that Aditya faced when going to Kashmir and how he fell back within to answer that riddle. When writing about the relationships within the book I was aware that they are unusual and grow in a context that doesn’t permit people to do what they want freely but are bound by an ideology of hate in a garb of religion. The book has been a search, a journey for me and I knew I will not be the same again after writing this. When you feel driven by a search for truth, it is a mixture of emotions of all kinds rolled into one, some enjoyable some not. Truth is alternately disturbing and then sets you free. That is the feeling I have about writing the book. Yes totally. The book cover had to be surreal in way that it talks of an interface between the two major religions and their proponents who come directly in touch with each other, facing and confronting the harsh reality that surrounds them. It shows a lone man against a mountain, his home and he looks in a wandering sort of a way trying to reclaim it for himself. It shows man’s relationship to himself with the larger system of religion he has created for himself to understand God and the universe. It also shows the deep underlying connect that we have to nature and the healing it brings, here Kashmir. We got the help of a wonderful team who made the cover for us and it has been liked by everybody so far. We all get inspired by the people living around us and incidents happening around us. Writers take a lot of inspiration from these realities and then mix it with fantasies. While writing mythology there is not much scope, however a lot of imagination has to be weaved in the tale. Can you share any of the real incidents which helped you in writing this book. Yes, two incidents. One was when coming out of one of the refugee camps for Kashmiri pandits in Jammu, an old Kashmiri, later I learnt he was a teacher, accosted us and told us the camp represented the dream of Aurungzeb who wanted Kashmir to be free of Hindus and the camp represents the last vestige of the Hindus who have run away facing death or conversion and the outside world which is silent about it till today. That incident where we confronted the trans-generational trauma of our people and how it has been distorted and presented to the world that it is only the Kashmiri Muslims who suffer was deeply disturbing and can be called the moment when I decided to write the book. The second incident was when I heard the story of Battmazar from my father in law who lived in Kashmir till his youth. The story of how Hindus were taken to be converted and how they resisted was an experience that deeply disturbed me. It is a tale every Kashmiri pandit knows but no one talks about. When I wrote about it, one day a relative who read the chapter said, “I am glad in my lifetime someone has written about it but regret is it is not a Kashmiri pandit. When will we take ownership of our own history?” he wondered. The third story was about transformation. As a psychologist I saw deep transformation taking place within a person despite being indoctrinated in violence through the cruelest of methods. It permanently changed my belief that human beings can’t change from within once they see how similar is the enemy to them. It is not an easy process though but one that is tinged with infinite possibilities for the future of mankind and is open to discussion and debate. I wish my book may contribute towards that. Why should one read, The Infidel Next Door, according to you? To see the universality of the human condition that despite being bound by another set of rules and ideology of bigotry, of being indoctrinated to hate each other, our inner selves remain the same and given the context, the heart may create an opening that results in a transformation. Every book affects its author in some way. How do you think writing this book affected you? It has changed me towards being more compassionate and open to those practicing other faiths and understand where they come from. I have read now most of the major religious books of mankind and find that they were products of their times and need to be understood critically and need reformation that can only come from the understanding that we must give up the aura of exclusivity that we hold around our religion. I am primarily a method writer. I write everyday for a few hours, no matter what. Sometimes I get impulsive too and write when an idea strikes me and takes hold of me. Then I write on whatever paper I get around me wherever I am. If I am at a party I take a paper and pen and go outside to write. Thomas Mann, Hermann Hesse, James Baldwin, Manto, Premchand, Tagore, Khaled Hosseini and Guntur Grass, V S Naipaul. All the light we cannot see, The sympathizer and The last of the just. I don’t enjoy e-book as much but it’s a personal preference. I haven’t grown up with them and don’t find them as stimulating as much as a physical book. But I realize that they are the medium of the future and many people find it easier to read one than a physical book. The impact of e-books have been really big in taking many a books to the masses which it otherwise would not have taken place. There is an entire category of readers who prefer the e-book and I acknowledge the role it will play in the coming days. Listening to classical music both Indian and western. Please share your Social Media / web presence, so that readers and fans can follow/contact you. I am getting an author’s website made. I write regularly on Facebook and Blogs on social issues of relevance. I am on Twitter, LinkedIn and Youtube. Yes it is a book on India’s freedom struggle and the story of a family who believe that the British will not leave India till they are forced to. While they respect Gandhi they live under harsh reality of torture, abuse and atrocities that the British force upon them and other families. The contribution of those families who gave everything for the country is not written and neither is about what they went through. The terror the British faced after the second world war thinking that a repeat of 1857 is going to take place and that exactly didn’t come from the non-violence movement. It is tough to find a publisher for a debutante author. Can you share your experiences of finding a publisher and ultimately get your first book published? All publishers wanted me to make major changes in the book to accept it for publication. I have written about it elsewhere. Some found it too controversial and asked me to not release it. The attitude of some publishers, intellectuals who were close friends was a disappointment as it made me realize the schism that exists between the two narratives as it pre-empts the possibility of a dialogue. It is definitely different from olden times and the idea of authors I carry in my head. It is definitely radical and we don’t know which direction it will take writing to. I can’t imagine Hemingway releasing his book through a trailer or John Steinback. Tagore or Premchand will find it difficult to release their works. To me the author has a profile which is not that of a showman. He has a dignity of a different kind that is reserved, introspective and analytical that if sacrificed will forever change the writing scene and perhaps stop the creation of literary masterpieces. That to me may be a bog loss. It needs to be preserved whatever may be the medium of expression. The present themes that seem to dominate the fiction market in India can by and large be divided in three themes. College life, teen romances, mythology. It is not difficult to make a trailer on these themes and attract buyers. There are hardly enough books written on social reality or human condition in India. If trailers do dominate I hope they portray it sensitively in order to capture the human condition of the novel. No, not exactly. I was a loner and grew up reading on my own. I read in a library at home that had more than few thousand books. My grandparents lived far away and died early so I never had that chance. My father was a wonderful story teller, a teacher but he mostly did that for his students and that remained a sore point for me. I think we need to respect nature. There aren’t enough books or a culture of how we are destroying it and the personal responsibility that each of us hold for that. The field of psychological trauma and its awareness has revolutionized the way societies see themselves and their history that has been suppressed. Fifty years ago such a book could not have taken place and I humbly believe that this book is a product of time. But I leave it to the readers to judge that. This book is a one with a message of the glorious past that we had, its decline and death and its resurgence. I believe there is a bit of my protagonist in all of us and his discovery of himself through his trials and tribulations. I would be honored if people say that they found it too.